I’m always trying to find ways to get some fresh greens into our diet. 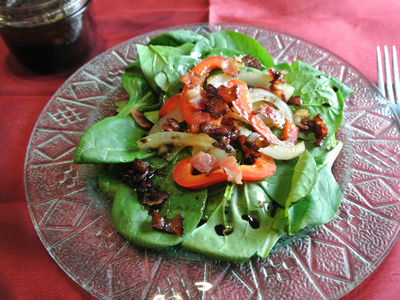 Fresh spinach is one thing that we all seem to enjoy and so to dress it up I roasted some onion and red bell pepper and made a warm balsamic vinaigrette. 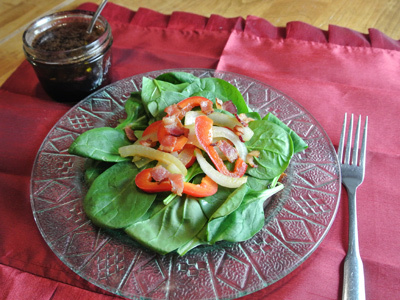 Adding the warm vegetables and dressing tends to wilt the spinach just a touch and makes this salad really delicious. And for my bacon lovers I added a little sprinkle of bacon bits to top it off. Start by frying 4 slices of bacon. Fry on medium high heat until crisp, then remove bacon to drain on paper towels. 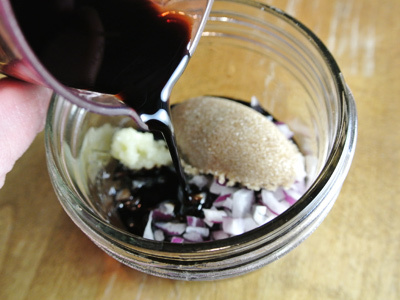 Save 2 tablespoons of the bacon grease. 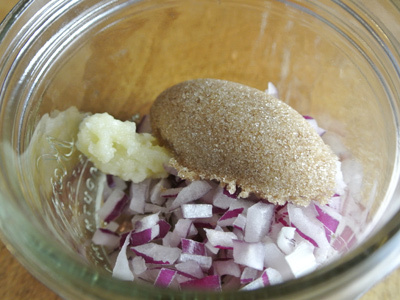 To make the dressing, place about 2 tablespoons of chopped red onion, 1 clove of finely grated garlic, and 1 tablespoon of brown sugar. 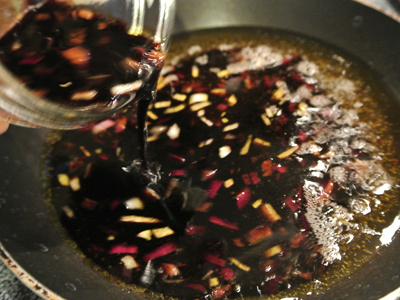 Add 1/4 cup of a good balsamic vinegar. Next add 2 tablespoons of olive oil. In a small skillet or saucepan, heat the reserved 2 tablespoons of bacon grease and pour the vinaigrette ingredients into the pan. Heat the dressing for 2 – 3 minutes, the onions will begin to soften and the flavors will blend together. 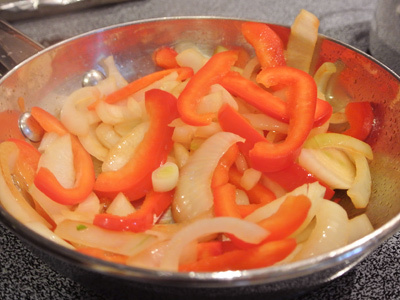 Cut 1/2 onion and 1/2 red bell pepper into slices. Drizzle a small pan with olive oil and saute the vegetables until they just begin to soften. Layer the spinach with some roasted red bell and onion slices and some bacon bits. Drizzle warm balsamic vinaigrette over top of salad. Divide Spinach among 4 salad plates. Fry the bacon over medium high heat until crisp. 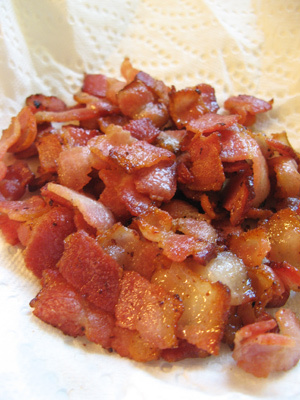 Drain bacon on paper towels and cut into smaller bits. Reserve 2 tablespoons of bacon grease. 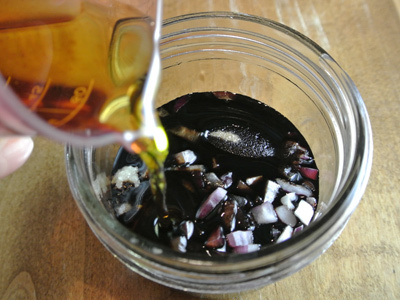 In a small bowl, combine the onion, garlic, brown sugar, balsamic vinegar and olive oil. Return reserved bacon grease to a small skillet or saucepan. Add the vinaigrette ingredients to the pan and heat over medium heat for 2 – 3 minutes to warm the dressing and soften the onion. Saute onion and red bell pepper in a small skillet drizzled with olive oil. Saute over medium heat until the vegetables become soft. 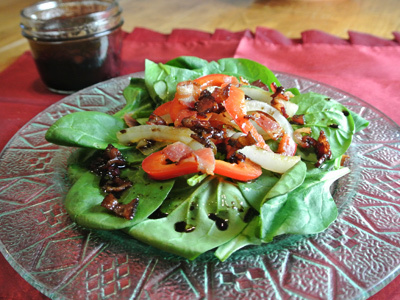 Divide the peppers and onions among the 4 salad plates on top of the spinach, add a sprinkle of bacon bits and drizzle warm balsamic vinaigrette over top. I know this is good! The vinaigrette is wonderful! Yum, bacon always gets my attention! 🙂 Beautiful salad Jan.
Me too! I love bacon in salads.